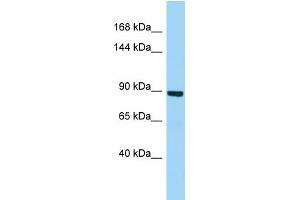 Characteristics This is a rabbit polyclonal antibody against MYSM1. It was validated on Western Blot. Background MYSM1 is a metalloprotease that specifically deubiquitinates monoubiquitinated histone H2A, a specific tag for epigenetic transcriptional repression, thereby acting as a coactivator. It preferentially deubiquitinates monoubiquitinated H2A in hyperacetylated nucleosomes. Deubiquitination of histone H2A leads to facilitate the phosphorylation and dissociation of histone H1 from the nucleosome. MYSM1 acts as a coactivator by participating in the initiation and elongation steps of androgen receptor (AR)-induced gene activation.